Cosmetologist Life will help you make the absolute most out of your beauty career! Whatever stage you are in, there is info here that is invaluable to your career development. Here, you will find valuable insight into our business that will literally put your career on rocket boosters. Working in the beauty industry is a wonderous thing. It is a very rewarding profession and lot's of fun too if you are doing the thing that you love. And within the profession are unlimited opportunities. You can specialize in any area where your passion takes you and make a decent living in the process. Even during downturns in the economy our line of work never gets hit like others. Because people will ALWAYS pay to look good. Yippie! That's great news for our wallets. Ka-ching. and those that barely get by. If you are considering a career as a cosmetologist, meaning hairstylist, esthetician or nail tech, you are wondering what the reality is and is it right for you. If you are a cosmetology student right now you can't wait to graduate and start working in the salon making that money. And if you are a new licensed professional you may be wondering what you can do to insure a more profitable future. I am all about helping new hair stylists work every angle available to maximize their earning potential and advance their careers. I think of myself as a salon "hacker." I was once a single working mother starting my beauty career with very little guidance. I did the best I could at the time, but over the years I have harvested some potent knowledge through experience and research. And I can't wait to share that knowledge with YOU. 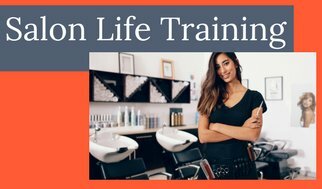 So if you are serious about having a successful and personally fulfilling cosmetologist career then hang around because there is much to learn. You would think that beauty school would provide you with all you need to be successful but that is just not the case. In fact, don't be surprised when you graduate if you can't cut hair. (That is kind of an industry joke.) Anyway, we will get to that. I am your #1 Stylist Advocate and Salon Buddy. I'll show you the in's and out's and specific things to do. Want to win a job over your competition? I'll give you techniques that blow them out of the water. Do you dream of being a fashion hair stylist? 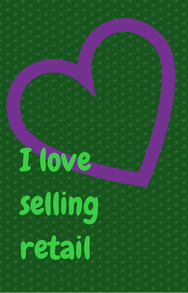 I will show you how to make a road map to take you to your heart's desires. Stick with me NEW Professionals (and soon to be's) and together we will color your career BEAUTIFUL. I can't wait! Let's get started. New Graduate from Hair School or other beauty professional? Working professional but still green? Working professional looking for career guidance? Working professional looking for income increasing techniques? The beautiful stylist holding scissors was so good I couldn't resist but I can't recall where the image came from. Please forgive me. You are a gorgeous inspiration for our new professionals! 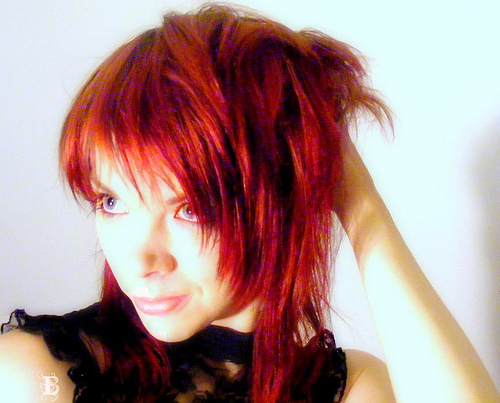 Cosmetologist Life Blog keeps you up-to-date on all additions and changes to cosmetologistlife.com Web site. 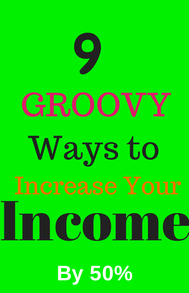 Don't miss out on income increasing techniques. Subscribe Here! Cosmetologist Jobs Let's Get You One! There are many cosmetologist jobs available to a newly licensed professional hair stylists. Beauty career jobs are out there and we are going to learn interviewing techniques to put you ahead. Beauty Career Planning to Get You Where You Want to Go in Life! Hair Schools for Professional Hair Stylists to fully develop their skills. 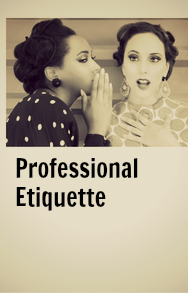 Professional hair stylist etiquette is the level of professionalism set by the salon culture. Selling retail in a salon for beginner hair stylists! 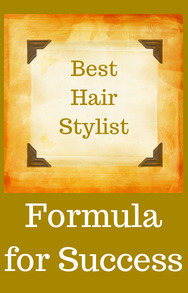 Is there an actual best hair stylist formula for success? Cosmetologist Personal Branding to Skyrocket Your Beauty Career! Personal Branding as a cosmetologist is creating a Brand out of You. 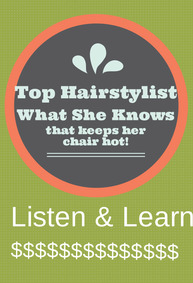 Top Hairstylist Retailing Tips: Learn From the Best in the Biz! Top Hairstylist retailing tips, scripts included! Your cosmetologist career will last much longer if you take care of yourself. Salon retail contest ideas will give you traction to increase your salon's retailing efforts. Top 10 Reasons to go to Cosmetology School! I have great news! There is a very bright future for your Beauty Career! These are the latest Cosmetology School Hours required by state for licensing. Make the most of Cosmetology School will help you get your money's worth from your beauty education. Hey cosmetologists! I am going to show you insider secrets to a successful beauty career that will change the way you manage your career and take you to wonderful places that increase your income! Custom Gear for those living The Salon Life!